GRAND JUNCTION, CO (BRAIN)—MRP has raised the bar for 2008 with the planned October release of the patented G2 chain guide system. The G2 will be the first model to go into production utilizing MRP’s patented integrated chainguide/bash guard technology. WHISTLER, British Columbia (BRAIN)—When creating the Konig, Corsair's goal was to channel the energy of a great run into the engineering and style of a slopestyle frame. SANTA CRUZ, CA (BRAIN)--Tour de France winner Alberto Contador of the Discovery Channel Pro Cycling Team and popular French pro cyclist Nicolas Portal of the Caisse d'Epargne Cycling Team, have signed agreements to exclusively use Giro’s new line of sport performance sunglasses. MIAMI, FL (BRAIN)–-Taking their love for BMX on the road, Bawls Guarana has teamed up with Shimano to outfit their sales team in Shimano’s most popular shoe. FERNDALE, WA (BRAIN)—Transition Bikes is getting into the women's freeride movement with the release of its prototype Siren model. The Siren's frame features 6 inches of rear wheel travel and female friendly geometry. WHISTLER, British Columbia (BRAIN)—Roughly 25 international media were in attendance for Norco's launch of its 2008 line at Crankworx. 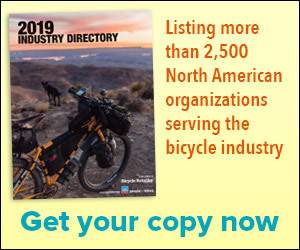 GOLETA, CA (BRAIN)—Bike-alog is publishing on the Web its vast database of bike specs for every year back to 1993. AMES, IA (BRAIN)—Cycle Source Group recently announced that they would begin manufacturing a broad range of Polaris and Victory bicycles, tricycles and related accessories as part of a long term licensing agreement with Polaris Industries. TREVIGLIO, Italy (BRAIN)—Thirty-five bicycle publications from across the globe attended Bianchi’s recent two-day 2008 bike launch. PASADENA, CA (BRAIN)—Don’t ever accuse Foes Racing of being weight weenies, not in 2008 or any other year for that matter. SAN JOSE, CA (BRAIN)—Traditionally thought of as a road brand, Look Cycle USA is looking to make strides with its mountain bike line for 2008. BLOOMINGTON, MN (BRAIN)—Quality Bicycle Products has added Civia, a line of utilitarian bikes designed specifically for commuting and light transport, to its array of house brands. SALT LAKE CITY, UT (BRAIN)—Polarpak recently announced that Oakley has chosen its MOFLOW™ pressurized bladder for use in the Oakley Tool Pouch 2.0 mountain bike/outdoor backpack. "In the immortal words of Jean Paul Sartre, 'Au revoir, gopher.'" —Carl Spackler from "Caddyshack"
GREENVILLE, SC (BRAIN)—Hincapie Sportswear has a renewed focus within the independent bicycle dealer channel. This is largely due to Nicole Bossie, who was hired in May as Hincapie’s retail market manager. She was asked to grow business in the retail market. SANTA CRUZ, CA (BRAIN)—Giro recently announced an exclusive partnership with Carl Zeiss Vision Sunlens. VISTA, CA (BRAIN)—Masi Bicycles has always been known for its rich racing heritage, but with its 2008 line it will exploring new territory for the first time.